Helion Energy has successfully raised $30 million raised in the past three years will be enough to get Helion through the debut of its 50-megwatt break-even nuclear fusion prototype. Helion’s commercial strategy is to build fusion reactors in Washington, with capacity of about 50 megawatts, and deploy them at industrial facilities. Helion Energy is building the latest in a series of prototype generators. They are building full-scale, break-even-or-better that is to be ready in 2018. They have raised enough capital to get it through that stage, Kirtley says, and April, 2018 brought on its 24th employee. They are targeting generating power at 4 cents per kilowatt-hour. In 2015, Nextbigfuture reported that Helion Energy had raised $10.6 million in funding. The company disclosed the funds in a filing with the Securities and Exchange Commission (SEC). Helion planned to raise more than $21 million total in the continuing round. In 2018, Helion reported its fifth-generation plasma machine, nicknamed Venti (as in a Starbucks coffee cup size), went into operation in 2017. “Venti aims to compress a plasma target to 20 Tesla and to fusion temperatures,” Kirtley said in a follow-up email. The sixth-generation machine (Trenta?) is already being designed. And Kirtley expects the seventh-generation machine to hit net energy gain. Just don’t ask him when. “We’re working on it,” he said. Nextbigfuture interviewed Helion Energy CEO David Kirtley in 2014. An NSF, NASA, and DOD fellow, Dr. Kirtley has 13 years of experience in nuclear engineering, fusion, and aerospace and holds Nuclear and Aerospace Engineering degrees from the University of Michigan. He leads the MSNW propulsion research and development, serves as Helion’s CEO, and has raised and managed many high technology programs. Helion Energy is trying to achieve commercial Magneto-Inertial Fusion. This combines the stability of steady magnetic fusion and the heating of pulsed inertial fusion, a commercially practical system has been realized that is smaller and lower cost than existing programs. Helion Energy will be magnetically accelerating plasmas together and then compressing them once per second. David indicated a breakeven fusion machine would need about $35 million in funding. Seattle Business reports that Helion has raised the money and will complete this targeting breakeven machine this year. There was a two or three-year delay to get the funds. Shifting the dates discussed in 2015. If all goes well this year then Helion Energy machine that proves commercial energy gain would be a 50 Megawatt system built in 2021. $200 million would be needed for the commercial pilot plant. The plan would be to start building commercial systems by 2024. Funding seems to be main issue maintaining the dates and currently Helion Energy is not committing to dates. Helion is creating technology it calls “The Fusion Engine,” which would use helium from engine exhaust, according to the company’s website. The helium, along with deuterium fuel from seawater, would be heated to become plasma and then compressed with magnetic fields to reach fusion temperature, which is more than 100 million degrees. Helion Energy will investigate staged magnetic compression of field-reversed configuration (FRC) plasmas, building on past successes to develop a prototype that can attain higher temperatures and fuel density than previously possible. The team will use these results to assess the viability of scaling to a power reactor, which if successful would offer the benefits of simple linear geometry, attractive scaling, and compatibility with modern pulsed power electronics. * Magneto-Inertial Fusion: By combining the stability of steady magnetic fusion and the heating of pulsed inertial fusion, a commercially practical system has been realized that is smaller and lower cost than existing programs. * Modular, Distributed Power: A container-sized, 50 MW module for baseload power generation. * Self-Supplied Helium 3 Fusion: Pulsed, D-He3 fusion simplifies the engineering of a fusion power plant, lowers costs, and is even cleaner than traditional fusion. * Magnetic Compression: Fuel is compressed and heated purely by magnetic fields operated with modern solid state electronics. This eliminates inefficient, expensive laser, piston, or beam techniques used by other fusion approaches. * Direct Energy Conversion: Enabled by pulsed operation, efficient direct conversion decreases plant costs and fusion’s engineering challenges. * Safe: With no possibility of melt-down, or hazardous nuclear waste, fusion does not suffer the drawbacks that make fission an unattractive alternative. Previously there was talk about creating a fusion engine to help burn fission waste (unburned fission fuel). It would need to produce a lot of neutrons. This turned out to be more difficult and less practical. The work indicates that aneutronic Helium 3 – Deuterium is the best path forward. Tri-alpha Energy’s system looks similar to Helion Energy. What is similar and different ? Tri-alpha energy also creates and merges plasmoids. However, Tri-alpha sustains the merged plasmoids with colliding beams. Helion Energy will be magnetically accelerating plasmas together and then compressing them once per second. What recent technological advances have helped Helion Energy ? Newly available electronics technologies have enabled a revolutionary design to make fusion a commercial reality. The power switching electronics in Wind turbines and in other energy systems helps Helion Energy. In the future if better superconducting batteries and materials are created it would allow improved Helion Energy reactors that are smaller and more powerful. Current technology is sufficient for the 2019 2021 design. It is a matter of engineering the details correctly. How does the University of Washington, MSNW LLC and Helion Energy work fit together ? University of Washington is where the basic scientific research is done. MSNW LLC is for the SBIR and other grant work and to prove out work that could potentially be commercialized. Helion Energy is for the commercial venture funded nuclear fusion development. The dots on the graph, HF 2012 (Helion Fusion 2012) and IPA HF 2013 (Inductive Plasma Accelerator High Field 2013) are their prototype performance. They want to get the 10 tesla performance about 20 times better for the breakeven 20162018device. They will go to 12 tesla for the 20192021 version. Ge on the graph is the gain. So Helion energy is at about 20% now. Targeting between 1 and 2 in 20162018 and a gain of 10 in 20192021. Helion Energy came up with a new approach and by leveraging $5M from the Department of Energy they proved the technology in a series of breakthrough prototypes that are generating Deuterium-Deuterium fusion today at a small scale. This success gave them a significant technical lead over their competitors and, with additional backing from Mithril Capital (Peter Thiel and Ajay Royan’s firm) and Y Combinator, they increased performance by a factor of 25. Helion’s technology operates in a promising new region, midway between steady magnetic and inertial fusion. The Fusion Engine works like a diesel engine with electromagnets in place of moving pistons. Fuel is injected and compressed with magnetic fields. It fuses and the expanding particle energy is directly converted to electricity, pulsing once per second. Helion’s Fusion Engine, if it works, will not produce radioactive waste and will not put Carbon into the atmosphere. It will be safer than nuclear fission, will only require plentiful Deuterium as a new fuel input (Helium-3 is captured and reused), and will end energy dependence on other nations. This wouldn’t have been possible ten years ago. Recent advancements in high power electronics, developed for space propulsion and the smart grid, is what enable Helion’s Fusion Engine. There are four major private companies competing in the fusion space. Helion’s reaction is 1000 times easier to achieve than the reactions other clean fusion companies are pursuing. Helion’s pulsed approach enables us to take advantage of advanced Helium-3 fuels and by capturing the alpha particle energy directly the company eliminates the need for steam turbines and cooling towers (and the associated energy losses). 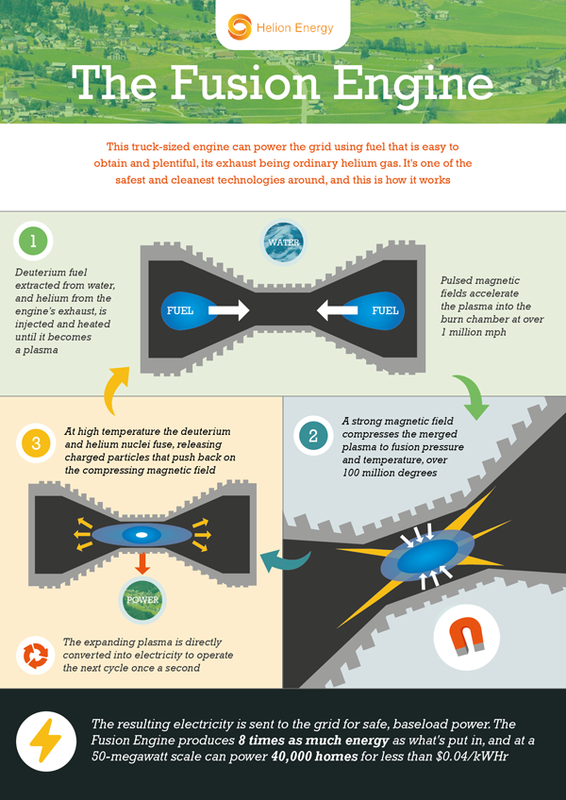 By capitalizing on small, pulsed magnetic, fusion Helion can reach profitable energy generation in a fraction of the time and cost. Helion plans to reach breakeven energy generation in less than three years with just a few tens of millions of dollars; this is nearly 10 times faster and more than 1000 times cheaper than ITER. Independent estimates are that Helion’s wholesale electricity will be approximately 2 cents per kilowatt-hour, which means electricity could be sold to consumers for around 4 cents. * Helion’s technology is the only proven, practical, reactor assembly in existence with greater fusion output than any private competitor. * The Fusion Engine was designed from the ground up to be a competitive commercial device, yet is based on demonstrated physics, technologies and Helion’s patented scientific breakthrough. * The world-renowned scientific and technical team has a deep knowledge of the science, and unique experience in the technologies and the scales required for a commercial reactor. * The science of the Fusion Engine has been rigorously demonstrated and peer-reviewed. * Helion has radically reduced risk by validating the technology with over $5 M in DOE funding. * The Fusion Engine is compact (semi-truck sized) will be able to generate lower cost electricity than current baseload power sources. * The management team won the 2013 National Cleantech Open Energy Generation competition and awards at the 2014 ARPA-E Future Energy Startup competition. Helion Energy’s long-term strategy is to generate revenue based on a royalty model of electricity produced with projected electricity prices of 40-60 $/MWhr (4 to 6 cents per kwh). Penetration of the new capacity market is estimated at 20% of market growth (2.5%) per annum eventually reaching 50% of new power generation worldwide – $52 B/yr. Gradual displacement of existing plants provides for continued growth to 20% of world electrical generation after 20 years with a net return of over $300 billion.